While looking at adoptable pets on Petfinder earlier this week, I came across this cutie. His name is Junior and he is looking for his forever home. 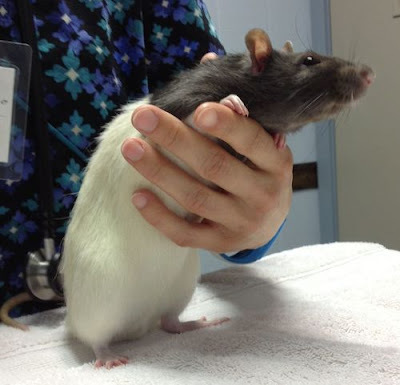 He's a male rat that was surrendered to a shelter by his people after his cagemate passed away. Not only has he lost his friend, but his people too. He sure is a lonely little guy and would love a new family of his own. Hi - my name is Junior! Junior is a little bit shy and skittish, but does not bite. He loves to eat yogurt drops and treats. He is currently being cared for by Forgotten Friends - Mixed Breed Rescue. I would love to make someone happy! I so wish I could take in little Junior as he looks so handsome. I don't think it's such a good idea to have a male and female rat together though. Nibblet is a girl ratty, so it's probably best that I don't. If you or someone you know might be interested in adopting little Junior, you can visit his Petfinder page here! Good luck to Junior. Have a serene Sunday. Good luck to Junior for finding his home! We have our paws and fingers crossed for a forever home, soon! I know it sure is sad. I hope he finds a home soon. Poor Junior, he is such a handsome little guy. We sure hope a better forever home comes soon. Good luck Junior on finding your forever home. 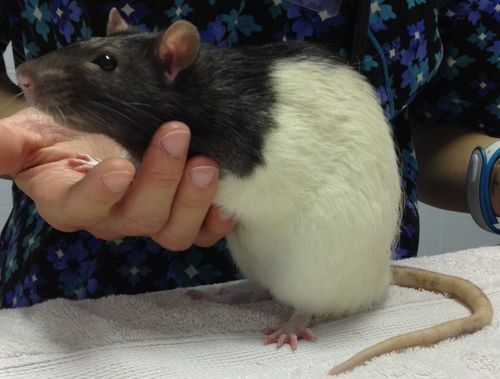 I work with a lady whose children have two rats as pets. She absolutely adores them. He is a cute guy, hopefully he finds his forever home soon. Poor Junior. Thank you for blogging about him. I hope he finds a good home soon. Purrrrrrrrrrrrrrs. Thank you Mizz Bassie. I hope so too. Aw, I used to have rats. They are lovely pets. I can't have any now, though, because I couldn't trust at least one of my dogs around it. Plus, I dog sit a lot and wouldn't risk it. Good luck to this baby! They sure are lovely pets. I am glad that my dog gets along with my rat. I figured she would when I got the rat because she used to have a ferret friend when she was younger. I wonder if it is difficult to place a rat? Hope it works out. Hmmm I don't know really. It's easy to buy a rat from the pet store, and I'm not sure many people consider adoption. But then again, there probably isn't tons of rats for adoption making it easier to find one to adopt maybe? I hope Junior finds his forever home soon!